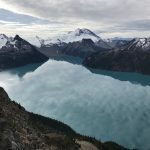 Another September weekend with a great weather forecast, so we chose an easy, accessible backpacking trip to Garibaldi Provincial Park. 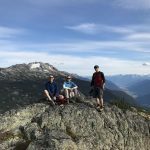 We hiked into Helm Creek campsite from Cheakamus Lake and then headed up through the Cinder Flats to Panorama Ridge. Spectacular views and a nice alternative route into the park. 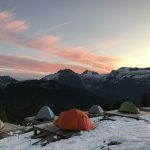 One of the easiest hikes into spectacular alpine in the region. 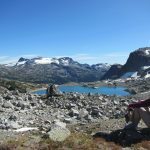 For this reason, it’s a really popular hike, despite being a long drive from Vancouver, past Pemberton, through Pemberton Meadows, and up the Hurley Road towards Goldbridge. We spent one night, and with an earlier start we could have bagged Locomotive Mountain.